For women in the UK, the balance is shifting from ‘why start a business’ to ‘why not’? A recent study has revealed that the number of female entrepreneurs is rising three times faster than the rate for men. Nowadays, women don’t see being female as any barrier to starting their own business! New technology means that other barriers to enterprise are falling fast too. Beta means starting, quietly, in test mode. In fact every business should run for a period in beta. As they say, no business plan survives contact with the first customer. You can be struck with a brilliant business idea, but it is highly unlikely that every aspect will be perfectly correct first time. Starting in beta allows you to start quickly and evolve as you discover, through trial and error, exactly what your customers want. There has been a lot of macho clap-trap aired over the years about the level of commitment you need to make to a new business. How often have you heard that entrepreneurs need to give a new business 24 hours a day, seven days a week. Or, that the entrepreneur has to be ready to risk everything to get that new business idea to fly. Look around you. There are lots of businesses that operate from ‘5 to 9’ rather than from ‘9 from 5.’ For example, Radha Vyas worked in the evenings for a year to get her boutique adventure travel company, The Flash Pack, off the ground. 9-5 she continued to hold down a day job. And there are lots of businesses that operate from 9.30 to 2.30, to fit in with school hours. It is quite possible to start a business with no money at all. Review your skills, experience and the resources you have to hand and you may find that you already have something to sell. New technology means you could market and start selling for almost no investment. The new sharing economy has opened up reams of possibilities. Online platforms like peopleperhour, AirBnB and etsy can connect you with a market for your skills, creativity or spare room. You can set up a business in a single day if you have done your research and lined your ducks up in a row. Have a look at this article on setting up a business in a day that breaks the start-up process down into seven steps. There’s an abundance of online tools available today that will support you in setting up your own business from how-to guides to online lessons for example information on how to get funding or forecast cash flow. 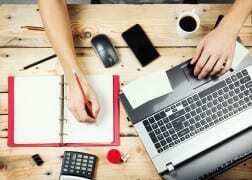 Home-based working is at its highest level in the UK since records began. In fact most new businesses start from home. Cloud computing means that you can easily work with others and communicate from anywhere. If you have a reasonable broadband connection, it doesn’t matter where you are based. Home-based businesses are creating their own colleague communities through social media connections and local networking and co-working meetups. 6. If not now, when? The musician Sting was asked recently to define creativity. Interestingly, he did not define it as ‘having great ideas’ or ‘shaping ideas into deliverable packages’. For Sting, creativity starts when you expose your ideas to the public – when you get past your sense of vulnerability and risk ridicule. You are not being creative if your ideas are not exposed and tested. So when are you going to take that leap?